← Was Pelagius Really A Heretic? Was Pelagius Right? Was Augustine A Heretic? Is Calvinism Heresy? 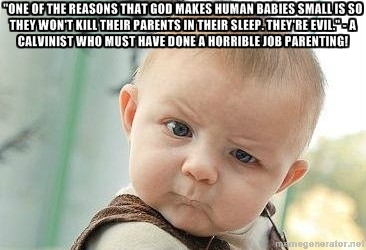 ARE BABIES SINFUL OR INNOCENT? Since Jesus said, “If ye were blind, ye should have no sin…” (Jn. 9:41), and since James said, “Therefore to him that knoweth to do good, and doeth it not, to him it is sin” (Jas. 4:17); infants are, therefore, morally innocent. This is because they don’t yet know right from wrong and they cannot yet know right from wrong. They have “no knowledge between good and evil” (Deut. 1:39) and do not yet “know to refuse the evil, and choose the good” (Isa. 7:15-16). Consequently, infants haven’t yet made any moral choices. Infants have not yet “done any good or evil” (Rom. 9:11). Without moral knowledge, you cannot have moral obligation or make moral choices. And without moral obligation and without moral choices, you cannot have moral character. It is impossible for infants to have moral knowledge due to the undeveloped state of their minds. Therefore, in their case, ignorance does equal innocence. Their ignorant state is not criminal since it is unintentional and unavoidable. That is why it says that King Manasseh did “after the abominations of the heathen, whom the Lord cast out before the children of Israel” (2 Kin. 21:2). King Manasseh practiced the same abominable rituals that the heathen, who used to occupy the land, did by sacrificing innocent children to Molech. God had specifically commanded, “When thou art come into the land which the Lord thy God giveth thee, thou shalt not learn to do after the abominations of those nations. There shall not be found among you any one that maketh his son or his daughter to pass through the fire” (Deut. 18:9-10). It was the heathen practice of the former occupants of the land to sacrifice innocent children. It says of King Manasseh, “But he walked in the way of the kings of Israel, yea, and made his son to pass through the fire, according to the abominations of the heathen whom the Lord cast out from before the children of Israel” (2 Kin. 16:3). – A sinner is someone who chooses to sin. – Therefore, men are sinners by choice; men are sinners because they choose to sin. We see then that men are sinners, not because they have a corrupted and ruined nature which makes them sin or which is sinful itself, but because free will is a faculty of their nature and they use that faculty to choose to sin. But if all men are free to sin or not to sin, why have all men freely chosen to sin? If Adam had freely chosen to sin, with all the advantages that he had over us, it is no wonder that we too have chosen to sin, since we must deal with the world, the flesh, and the devil. While Adam faced temptation from only one source, the world we are born into is full of temptation everywhere. And the devil has had many years of practice in deceiving mankind. The devil has not stopped tempting men. We encounter far more temptation in our world than Adam did in his. And we face a crafter devil than Adam faced. So it is not unbelievable to think that we have freely chosen to sin just as Adam did. The Bible says, “But they like Adam have transgressed the covenant” (Hos. 6:7). We have all freely sinned just like Adam did. We are all conscious of having sinned; and we are all conscious of having alternative possibilities, which we can choose between when we are tempted. That we have free will and that we have all sinned are both true. We never had to break the law of God, but we all have broken the law of God. This is the great tragedy of our race and it has brought much heartache to God. A sinner has nobody to blame for his sinfulness but himself. 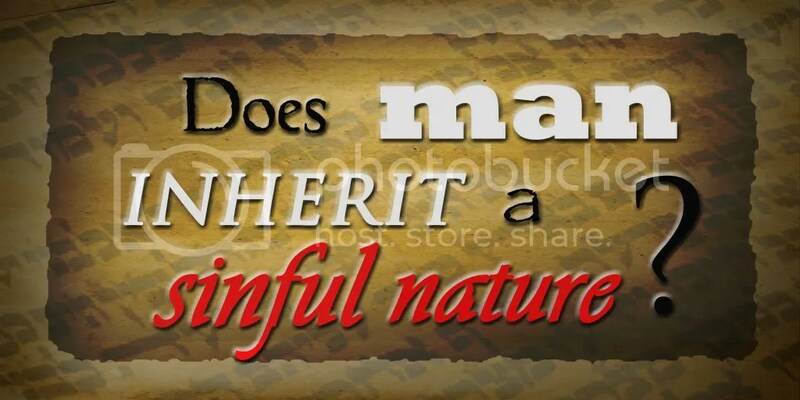 God has made sin avoidable by giving us a free will and God has influenced us not to sin by making conscience part of our nature; but despite the efforts of God, mankind has sinned anyway. “God hath made men upright; but they have sought out many inventions” (Ecc. 7:29). God’s problem with men is not with their constitutional abilities but with how they are using their constitutional abilities. Our sin cannot be blamed on anything behind our will, outside of our will, or independent of our will. Our will itself is the cause of sin. It is in our will that sin originates. The Bible says, “And the Lord said… they have rejected me, that I should not reign over them” (1 Sam. 8:7). Jesus taught, “But his citizens hated him, and sent a message after him, saying, we WILL NOT have this man to reign over us” (Lk. 19:14). These citizens had rebellious hearts against their ruler. They had disobedient wills. Their problem was not their nature or with their constitutional abilities. Their problem was their will. It is not that they could not obey God, but that they would not obey God. It was a moral problem, not a constitutional problem. Men are sinners through the liberty of their will, not through a necessity of their nature. Again Jesus taught, “But those mine enemies, which WOULD NOT that I should reign over them, bring hither, and slay them before me” (Luke 19:27). Jesus said that their problem was their will, not their nature. Their problem was not inability, but how they were using their ability. Jesus didn’t say that they “could not” but that they “would not.” That is precisely why it is just for Jesus to slay them. They could submit to His reign but refuse to. Therefore, they rightly and justly deserve punishment. If they could not obey, however, it would not be right or just to command them to obey or to punish them for not doing so. It would be as cruel as punishing the lame for not walking or to punish the blind for not seeing. Sinners are objects of God’s wrath for sinning because they choose to sin when they don’t have to. God does not punish sinners because they couldn’t obey Him, which would be a fault of their nature, which they have no control over. God punishes sinners because they wouldn’t obey Him, which is a fault of their will, which they themselves cause. God told Israel, “As the nations which the Lord destroyeth before your face, so shall ye perish; because ye WOULD NOT be obedient unto the voice of the Lord your God” (Deut. 8:20). Sinners are punishable, not because they were not capable of obeying God, but because they were not willing to obey God. God had seen so much wickedness from mankind because of the influence of the devil that it is no wonder that when Job was an upright and perfect man, God took the occasion to boast about him to the devil (Job 1:8). But when God was boasting to the devil of the moral purity of Job, the devil knew that Job’s uprightness and moral perfection was volitional and, therefore, he sought to bring about circumstances which would influence Job to choose to curse God and die (Job 1:9-12). The devil knew that Job was living holy by choice. Therefore, he thought to influence Job to change his choice. It would make no sense for God to praise Job for his character or for the devil to try to influence him to change his character, unless his character was determined by his free choice. But just as it would make no sense to praise a being for being holy and righteous unless he was voluntarily holy and righteous by choice, unless he was free to be otherwise, so also it makes no sense to punish a being for being wicked and evil unless he was voluntarily wicked and evil by choice and was free to be otherwise. This entry was posted in Uncategorized and tagged Andrew Strom, Are babies innocent or sinful, Are babies sinful, are babies sinners, are infants damned, are infants innocent, are infants sinful, are infants sinners, Arminianism, Augustine, augustine on babies, augustine on infants, augustine on original sin, Augustinianism, Calvinism, Charles Finney, charles finney systematic theology, Charles Spurgeon, david brainerd, do babies go to hell, Does man inherit a sinful nature, does the bible teach free will, free moral agency, free moral agent, free moral agents, George Whitefield, george whitefield on original sin, Gordon Olson, Greg Gordon, Harry Conn, infant damnation, is baby baptism biblical, is original sin biblical, James White, James White original sin, Jesse Morrell, Jesse Morrell book, Jesse Morrell Doctrine, Jesse Morrell free will book, Jesse Morrell heresy, Jesse Morrell Heretic, Jesse Morrell heretical theology, Jesse Morrell ministry, Jesse Morrell open air outreach, Jesse morrell open air preacher, Jesse Morrell street preacher, Jesse Morrell Theology, John Fletcher, John Fletcher on original sin, John MacArthur, John Wesley, John Wesley on original sin, jonathon edwards, jonathon edwards on original sin, Josef Urban, Josef Urban Missionary to Mexico, Leonard Ravenhill, Loren Cunningham, Lyman Beecher, Methodism on original sin, Methodist, Methodist church, methodist church on original sin, Moral Government Theology, Nathaniel W Taylor, natural innocence of infants, new divinity, New England Theology, new england theology on free will, new england theology on original sin, New Haven Theology, new haven theology on free will, new haven theology on original sin, New School Theology, original sin, original sin proof texts, orthodox ancestrial sin, Orthodox Church, Paul Washer, Pelagianism, Pelagius, pelagius on babies, pelagius on infants, pelagius on original sin, R C Sproul, Revival, Samuel Hopskins, Second Great Awakenings, Sermon Index, should babies be baptized, Todd Friel, Todd Friel on babies, Todd Friel Wretched Radio, Todd Friel Wretched TV, Tony Miano, Wesleyan Arminianism, Wesleyanism, what is original sin, Winkie Pratney, Youth With A Mission, YWAM. Bookmark the permalink.